A runner in wraparound shades powered past me on the tips of his toes as I ploddingly stepped up, up, and up. Up through the forest dotted with homes snugged against the steep slope. Up past tinkling wind chimes and a pixie-sized Middle Earth garden display. Up and around a bend following an arrow rendered in bottle caps. Up, up, up the stairs I climbed—all 688 of them. More than a bit ashamed at my huffing and puffing, I paused at the top to take in the green folds of Mt. Tamalpais butting up against the thick cloud cover. “Trail’s up there,” said a grey bearded man pointing up the road. The trail continued for a stretch through a hillside neighborhood before diverging over a busy road. 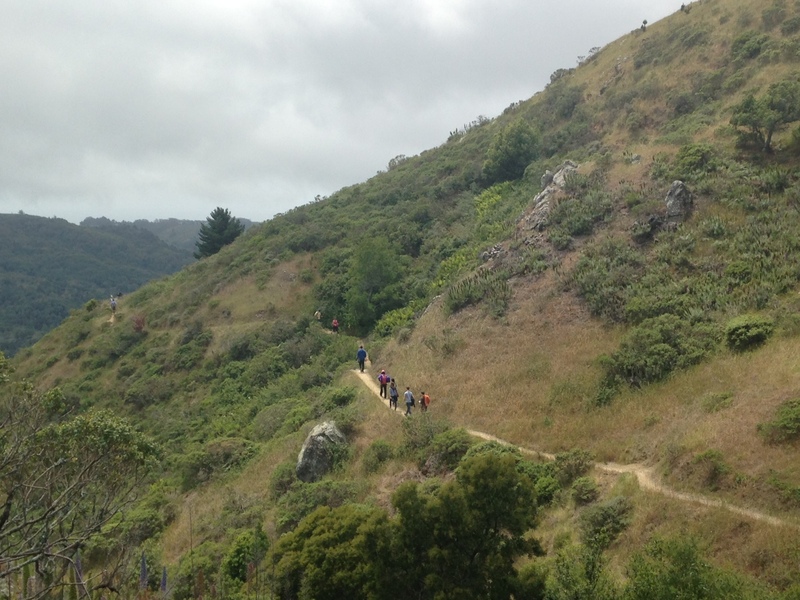 Beyond, on a mist-swept path lined by bobbing grasses and yellow wildflowers, a line of fellow hikers wound over a ridge and out of sight. As the trail re-entered the forest I heard the oom-pah music—the steady blat, blat, blat of a tuba carrying the bright, enthusiastic swirl of accordion. A little further and the forest opened up to reveal an alpine lodge tucked amidst the green canopy. 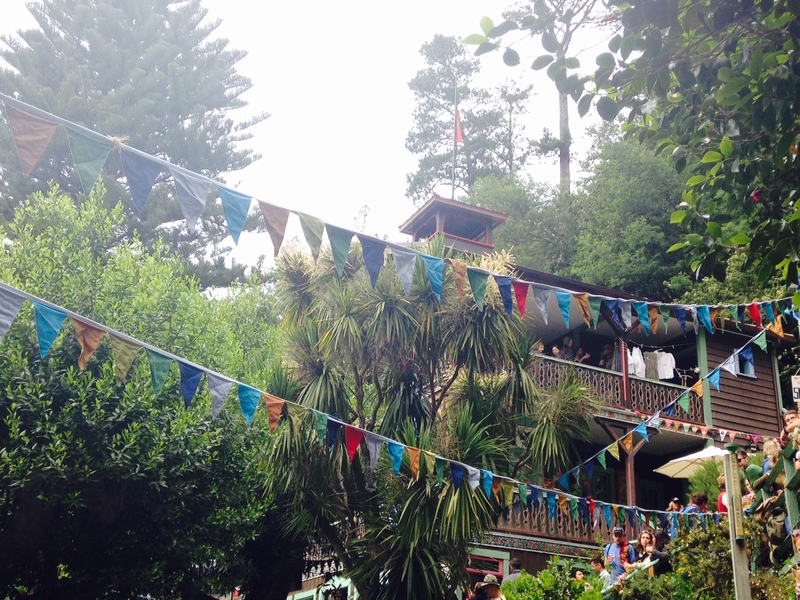 People were everywhere—leaning on balcony railings, pints of beer in hand; dancing beneath colorful pennant banners strung between the trees; shoulder to shoulder on long picnic tables tucking into grilled sausages and fat, salty pretzels smeared with mustard. Inside the lodge I grabbed a beer from the cozy barroom outfitted with a wood burning stove and trimmed with old climbing picks and a large painting of a sweeping, romantic alpine vista. 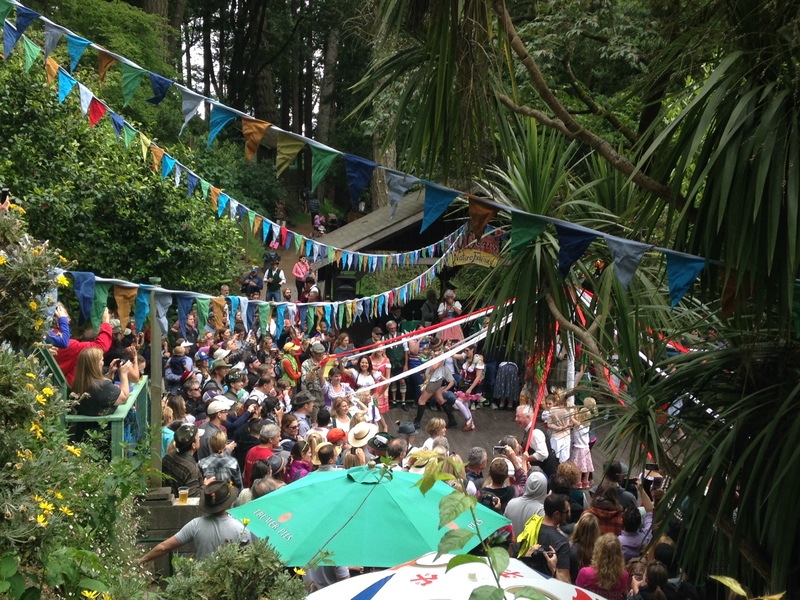 Beer in one hand, sausage in the other, I stood on the steps looking down at the dance floor through the foliage. The brass moved in lively step with couples in dirndls and lederhosen in varying degrees of authenticity twirling and prancing along. Behind me, a little girl in braided pigtails and an embroidered blue skirt hefted a tray full of pretzels the size of her head down the stairs. I joined the mob gathering around her and somehow squeezed a pretzel into my already snack-laden hands. The music paused and a flower-crowned maypole was presented to a cheering crowd defiant of the early onset of the Bay Area’s signature dreary summer chill and moody grey skies. Grabbing the maypole’s skirt of red and white ribbons, a gaggle of little girls circled the pole to more cheering and applause. With a trilling burst of the accordion, folk dancers took the floor leaping, stomping, and slapping their shoes and thighs (and the occasional rump of a passing partner). 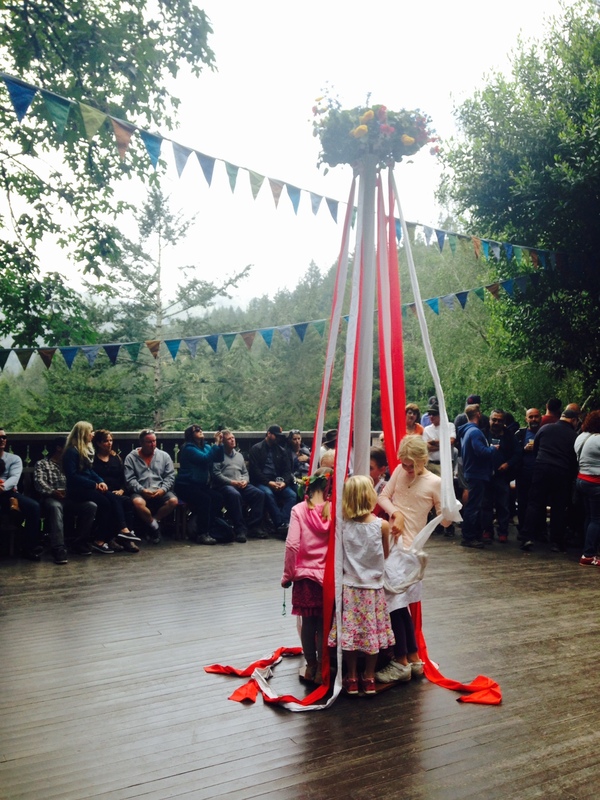 Holding the ribbons aloft they wound over and under each other, binding the maypole in an intricate knit. The round and rich oom-pah of the tuba swelled, the clarinet fluttered, and the ring around the dancers dissolved as the crowd retook the floor; a toast to Spring, cloudiness be damned.